The Alabama Sports Writers Association selects a high school football Coach of the Year in conjunction with the announcement of the All-State Team. 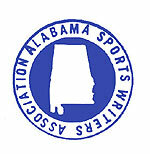 The award was first presented in 1982 by the ASWA. Prior to this other News Organizations would select a coach of the year annually for each classification.